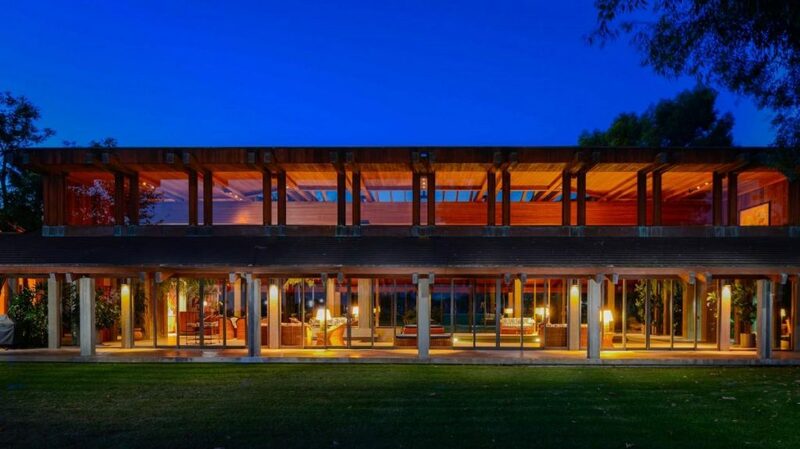 Del Dios Ranch, a 210-acre property with a Valencia orange grove and an 8,500-square-foot glass, redwood, and concrete home, hit the market for $92 million. It is the most expensive asking price for a residence in San Diego County ever, according to the listing agent. The estate, in the upscale San Diego enclave of Rancho Santa Fe, includes a four-bedroom main home and a one-bedroom guest home. The structures were built with northern California redwood, and the home’s marble floors lack grout. Though the home was built in the early 1970s, listing agent Linda Sansone described it as “soft Contemporary” for its walls of glass, concrete features, and marble floors. “It was built before its time. It’s a timeless design,” Sansone said. The architect was Fred Briggs; interiors were by Arthur Elrod. The main home features a great room with vaulted ceilings, and its total square footage includes a 3,000-square-foot pavilion that houses an indoor swimming pool and spa. The property also has an outdoor tennis court, a six-stall horse barn, and a lake. 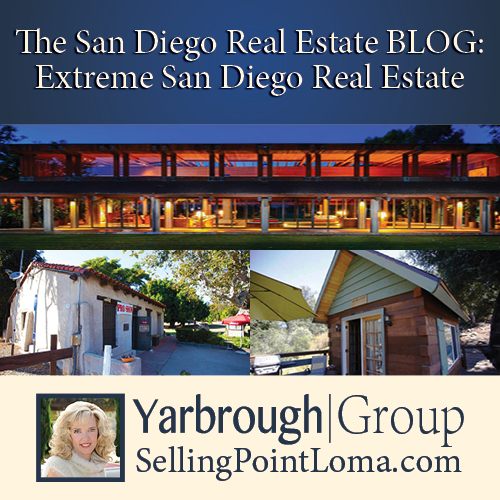 The main home is located within The Covenant neighborhood of Rancho Santa Fe, which has a golf course and access to 50 miles of horse trails. Thanks to Forbes.com for the info. An hour east from downtown San Diego, past a thicket of coast live oak trees and blackberry bushes, is the last frontier of homeownership in Southern California. 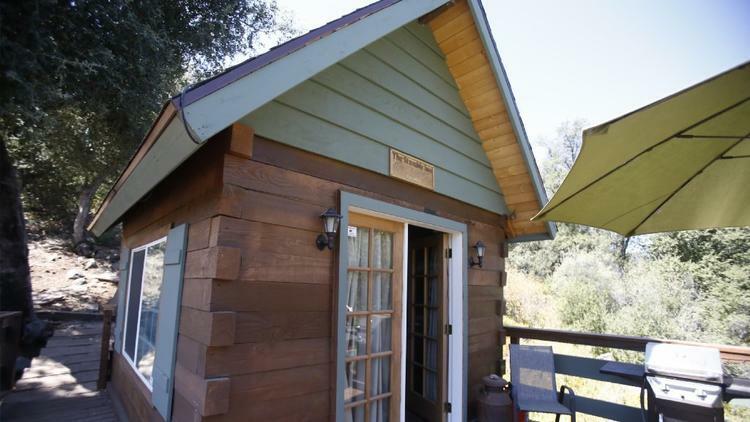 A tiny home (some might call it a cabin) in the unincorporated community of Guatay is on the market for $99,000, nearly $400,000 less than San Diego County median home price. Built by the previous owner and his son in 2015, the 220-square-foot home in the Cuyamaca Mountains is one of the cheapest residences for sale in a county that has seen home prices rise 12 percent in the last year. It doesn’t have a bedroom, and you have to use an outhouse, but the buyer will own the roughly third of an acre the house sits on — unlike other cheap options on federal park land or in mobile home parks. “In Southern California, to own a third of an acre of anything is fabulous,” said Theresa DeCristoforo, the agent with the listing. The home is run exclusively on solar panels, which power a TV, toaster oven and lights. Water has to be shipped in and placed in a 175-gallon tank. A small water heater is used for a shower. Painted a light olive green on the outside, the inside has a TV, table and chairs, couch, ice box, small counter and cabinets for food preparation and a bed up on a loft. A small stand-up shower and sink are in the basement, along with tools and batteries to collect energy from the solar panels. The porch has a barbecue and fire pit. The previous owner of the home, at 26779 Old Highway 80, decided to sell it after realizing he wasn’t able to spend as much time there as he wanted, DeCristoforo said. The land, without the house yet built, was purchased in 2013 for $22,000, according to public records. ▪ A 2,000-square-foot home with three bedrooms and three baths, and a yard, for $69,000 in Sandyville, Ohio. ▪ A 1,216-square-foot home on 3.32 acres for $79,500 in Philipsburg, Montana. ▪ A two-story 1,934-square-feet Victorian home with four bedrooms and two bathrooms for $69,000 in Milford, Utah. Thanks to SanDiegoUnionTribune.com for the info. Presidio Comandante Francisco Maria Ruiz built this house next to his 1808 pear garden lake in 1821 for his close relative and fellow soldier, Joaquin Carrillo, and his large family. From this adobe dwelling, in April 1829, daughter Josefa Carrillo eloped to Chile with Henry Delano Fitch. When Ruiz died in 1839 and Joaquin soon afterwards, son Ramon Carrillo sold this property to Lorenzo Soto. 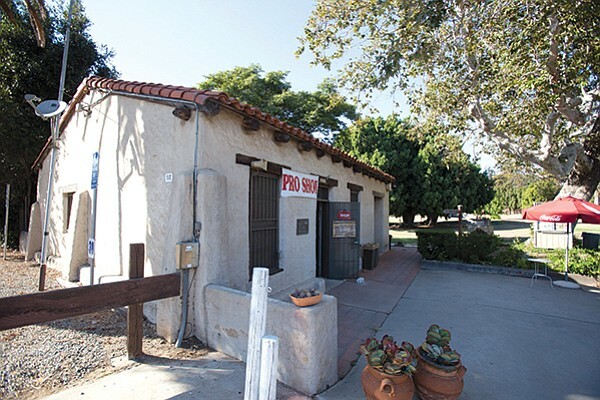 It was transferred several times before 1932, deteriorating gradually, until George Marston and associates restored the house and grounds and deeded them to the City of San Diego as a golf course. First registered December 6, 1932. Plaque placed by the State Department of Parks and Recreation in cooperation with the San Diego City Department of Parks and Recreation and Squibob Chapter, E Clampus Vitus, August 6, 1994. The is a bit more to the history, which you can read Photo: HERE. There is an on-going fight regarding the treatment of the property, waged by The Save Our Hertiage Organization, which you can read more about HERE.